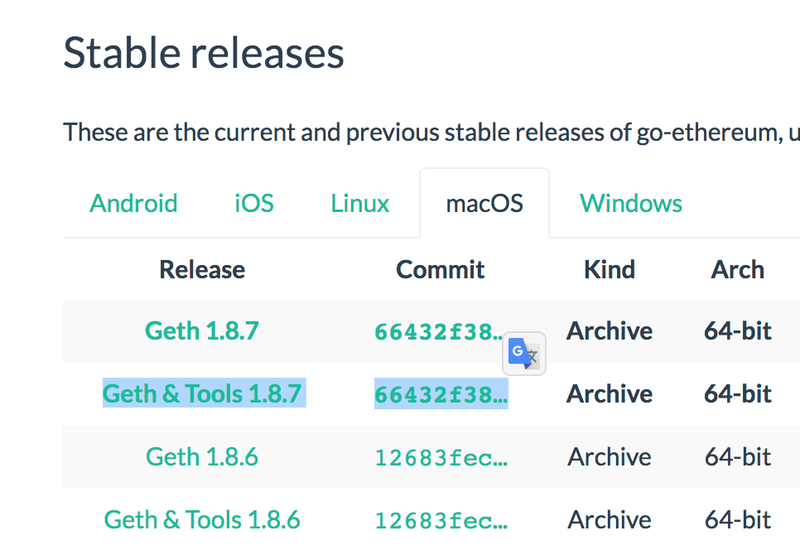 We’ve previously written about Geth, one of the most popular Ethereum nodes. Let’s take a look at the tool. Note: this tutorial will require you to have two remote machines at your disposal. Whether that is a virtual machine like Homestead Improved or an actual server on your network, or a combination of the two, doesn’t matter. We’ll go through the setup procedure with VMs in this tutorial. Note: due to a bug in Puppeth, this approach might not work if your virtual machines (see below) are too small. Either make bigger VMs (more RAM) or wait for a fix if that’s not an option. We’ll follow this process to get two virtual machines up and running. We need two machines because we’ll be running two Ethereum nodes, each on its own IP address. Note: This is a limitation of Puppeth, as it’s not possible to deploy a sealing node on the same machine using this tool. If you don’t know what Vagrant is, and what tools we’re using here, we recommend you read this introduction to Vagrant, which breaks it down in a newbie-friendly way. Change the IP address of the second clone by going into the hi_puppeth2 folder and modifying the IP address field to be 192.168.10.11 instead of 192.168.10.10. Don’t forget to add these virtual hosts into your host machine’s /etc/hosts file as well. Otherwise the VMs won’t be accessible by their domain name! Note: change the IP addresses if the addresses of your VMs differ. Finally, run vagrant up; vagrant ssh to boot each machine and SSH into it. Remember to run this from two separate tabs so you can keep both machines open and running. Now let’s install the prerequisite software on each machine. Puppeth runs helper applications and Ethereum nodes for you in Docker containers, so we need Docker. It’s also useful to install Geth itself. On the host machine (outside the VMs), we should create new Ethereum accounts in the folder where we’re running our project. If you’re using the VMs as suggested above, that can be in myproject if myproject is the parent folder which contains hi_puppeth1 and hi_puppeth2. We need two accounts because at least two signers are needed in a Proof of Authority blockchain (more on that later). Now that our VMs are running and our accounts are initialized, let’s see what Puppeth offers. 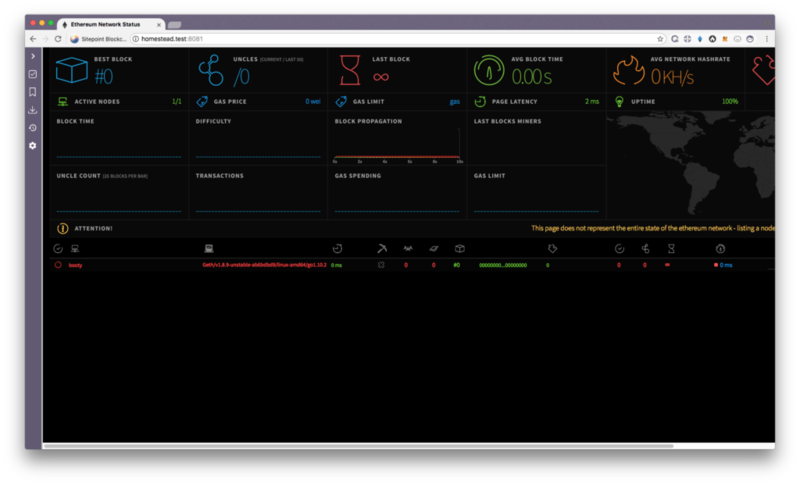 With the remote servers/VMs still running, in a new tab on your host machine run Puppeth with puppeth. The first thing it’ll ask for is the network name. This is useful for identifying various blockchains if you’re running several on your local machine. We’ll use “puptest” here. Sweet, you can set this via --network=puptest next time! Now let’s connect to our “remote” servers so that Puppeth has them in the list and can do operations on them. The authenticity of host '192.168.10.10:22 (192.168.10.10:22)' can't be established. Puppeth will ask for your SSH key’s passphrase just in case SSH is used to connect to the server. If not, it will ask for the SSH password (as it does in the example above). The default SSH password for the user vagrant on the VM in question is vagrant. The output at the end echoes the “health” status of the remote server. Since it has no services running, it will just list the IP. You can see the same result by selecting option 1: Show network stats. Repeat the process for the other VM, so both appear in the health status screen. To start our blockchain, we should configure a new genesis file. A genesis file is a file from which the first (genesis) block is built, and on which each subsequent block grows. You can find out about the difference between PoW and PoA here. PoW wastes a lot of computing power and is impractical to run on a local machine, so we’ll pick PoA here. We reduce the block time to 10 seconds so that our transactions confirm faster, and we add the addresses we generated previously as allowed sealers and as pre-funded. Being sealers means that they’re allowed to create new blocks. Since there are no mining rewards in PoA, we also pre-fund them with almost infinite ether so we can test our transactions with those accounts. The genesis file is now generated, and for backup purposes you can export it into an external file if you wish by selecting option 2 again. This isn’t necessary for now. Now let’s deploy some blockchain components! Puppeth deploys these components in separate docker containers using the docker-compose tool. Docker as a tool is outside the scope of this post, but you don’t need to be familiar with it to use this anyway. Let’s start with the first component, Ethstats. 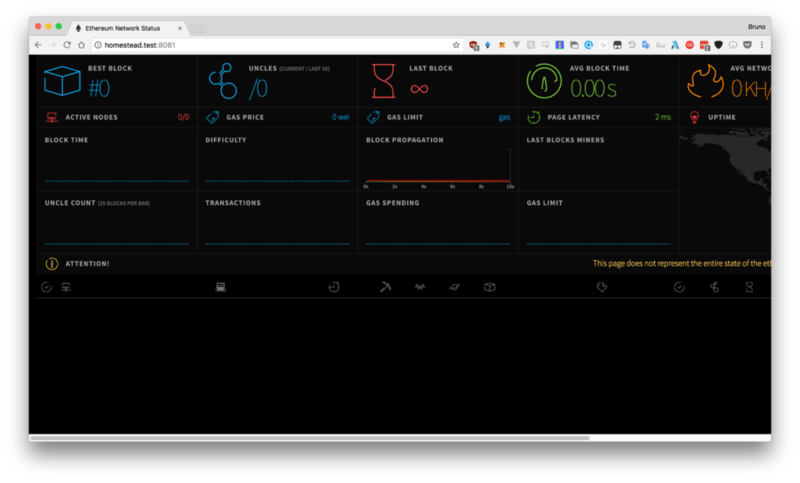 Installing Ethstats installs and runs a local version of the ethstats.net website. Select the first option. Which server do you want to interact with? Found orphan containers (puptest_nginx_1) for this project. If you removed or renamed this service in your compose file, you can run this command with the --remove-orphans flag to clean it up. We select the first previously added server. Then we add a port on which to deploy this software, and then name the domain through which we’ll access the app. Finally, we generate a simple “secret” for accessing the API of the app. Docker then takes over and builds the software for us. This application is currently useless: we need to deploy at least one node for this app to start showing something! A bootnode is a node which serves just as the first connection point through which an Ethereum node connects to other nodes. It’s basically a relayer of information helping nodes connect. Where should data be stored on the remote machine? What should the node be called on the stats page? Docker will build the node and run it. The location where to store data on the remote machine is arbitrary. We picked the vagrant user’s home directory. 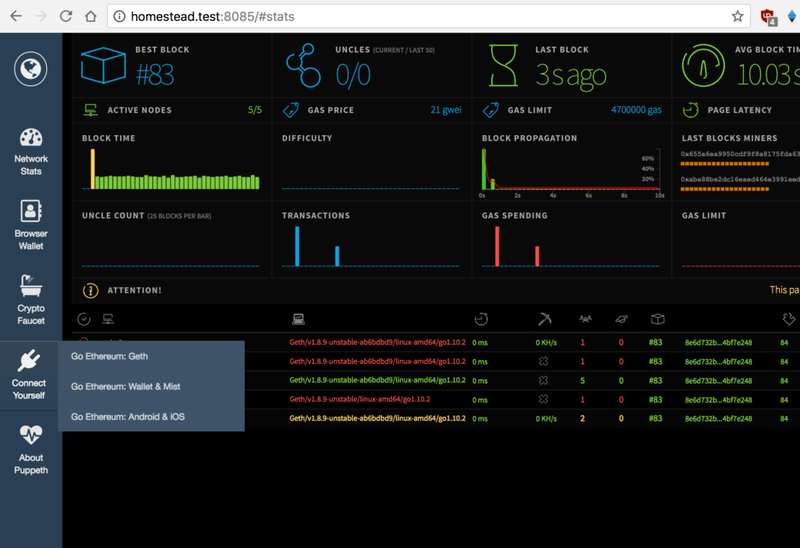 If you revisit the ethstats page now (homestead.test:8081) you’ll notice that booty is in the list of nodes! Note: if this is not the case and your bootnode is listed as offline in the healthcheck, reboot the remote server (with the VM, that’s vagrant reload) and then check again. All defaults, except location to store data and name of the node. For JSON, grab the content from the file we generated previously when creating new Ethereum accounts. That’s going to be in my_project/node1/keystore. The full contents of that file should be pasted here, and Puppeth will then ask for the password to unlock that wallet. Everything else from then on is automatic again. The health screen should show the node as working and it should appear in the Ethstats screen under the name you gave it. Next, repeat the process for the other machine (the one with the IP address 192.168.10.11). Give that node a different name, and use the other keystore file. In other words, set the other account we created as the sealer in this node. Your nodes will now be running and mining together. You should be able to see some progress on the Ethstats screen you deployed in the previous step. Note: if the status isn’t changing or a single block gets mined and then nothing happens, the nodes locked up . This can happen on fresh installations. Reboot the VMs and it will work fine. To be able to easily send Ether and custom tokens around, you can deploy your own version of MyEtherWallet using Puppeth. What should the wallet be called on the stats page? The wallet should be available and auto-connected to your test network. You can open a wallet by selecting JSON file as the means of unlocking it and pointing to one of the JSON files we generated earlier in the my_project/nodeX/keystore folders. Then enter the password, and you’ll have trillions of ether to send. You can use this local version of the wallet to create accounts on your private blockchain and thoroughly test everything. Go ahead and send some ether! A Faucet is a site on which a user can easily request some test ether. Publicly accessible faucets like the Rinkeby Faucet have protection mechanisms against spam, but our local faucet can be much less secure since it’s a test blockchain. Once these services have all been added, you should be able to see them in the Ethstats list. 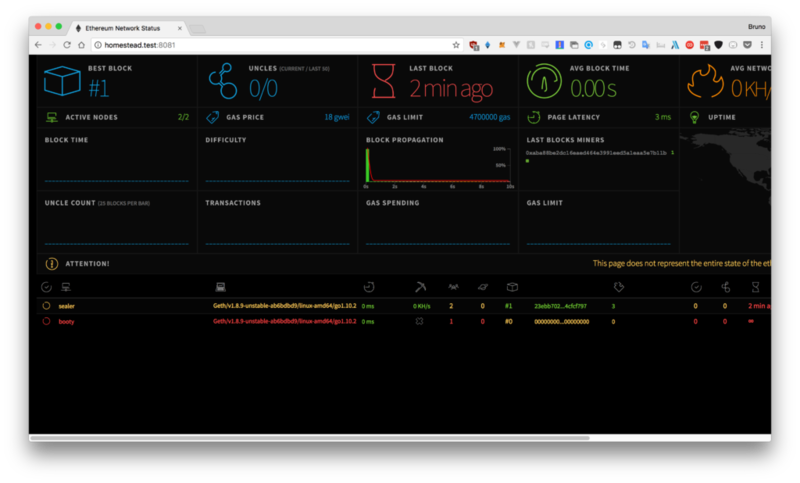 The dashboard is a collection of all the tools we’ve deployed so far, plus some instructions on how to manually connect to the blockchain we had built. You can now start developing your smart contracts with ease, and deploy them to your test blockchain through your local version of MyEtherWallet or the MetaMask integration of Remix, or any other combination. Puppeth is a one-stop shop of blockchain service management tools. It’s very handy when you’re doing blockchain development often, but can be complicated to wrap one’s head around. Hopefully this guide has helped you understand what it does and how it does it, and will assist you in your future blockchain endeavors. The Docker containers that run the components are configured to auto-run on boot, so rebooting either of the VMs will not require any reconfiguration, but you’ll need to re-add the servers into Puppeth if you want to further tweak some components or install new ones. Any questions? Ping the author on Twitter!